Hello, hello! We are back in the saddle and hope you had a fantastic Holidays and a fresh start to 2017. We have been on a rollercoaster of change and highly focused on our book. Besides some adversities with Miss. Mildred (our stove), we are working on her retirement and the stove transition to make it happen. We are extremely grateful for all the great people who have supported us during this time, whether if it has been a word of encouragement, an e-mail, a phone call, or a donation funding for the new stove to come. To all of you, THANK YOU so much! On the other hand, It is taking a little longer than we expected, with permits and responses, but as soon we have the stove we will shout it out loud and proud!, and of course we will send you a photo. This is the time of the year when quick breads like this fill up the house with warmth and delicious comforting aromas. MAKE THEM, It’s a must. I have had this recipe for about 25 years …from one of my grandma’s best friends. It is one of the first encounters I had with baking. My modern grandma Ana Fernanda used to make this cornbread; she used some canned goods and different chiles from the north part of Mexico including chile California a bright green chile mild in spice. Also she used Chihuahua style cheese and baked it in a big rectangular dish. By the time this corn bread hit the table it was pretty much gone, absolutely delicious. I decided to adjust the recipe and replace the canned goods by using fresh ingredients. For me it makes such a big difference in flavor and in texture. I used corn meal instead of corn mix, and interchanged the flour for gluten-free flour mix, which gives them a lighter and fluffier texture. The recipe works great with both types of flour, whether if you are using all-purpose flour, or a gluten-free all-purpose mix. Now, instead of a big rectangular bread, I think to portion them out it’s the ticket! 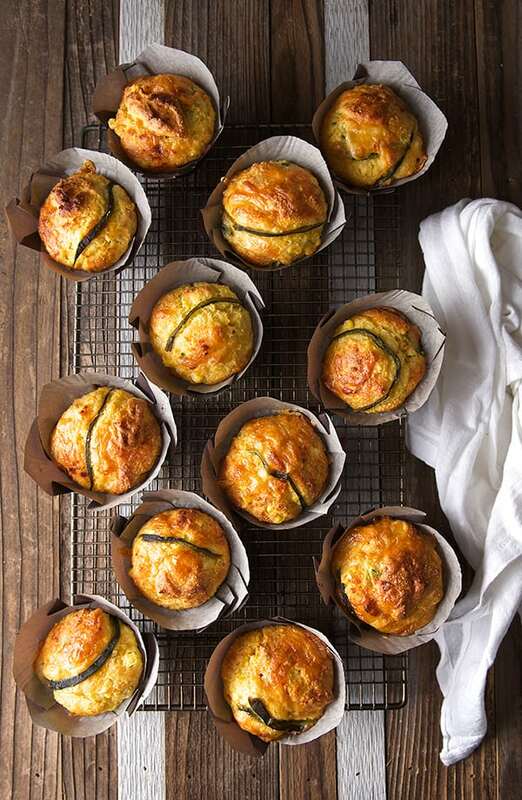 It cuts down the cooking time and each muffin gets an irresistible crusty top. I used Poblano peppers instead of California, Hatch chiles would be also great if you happen to have some frozen ones from this last season. 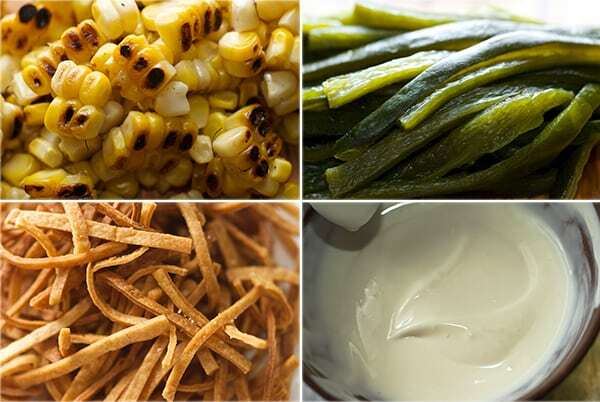 Now, do not worry about the Poblanos, they are mild with just a hint of heat that play really well with the sweet corn. Instead of Chihuahua cheese, since I could not find one of a good quality and flavor, I used Smoked Gouda. Use what you like, perhaps something local, mild with good melting qualities. 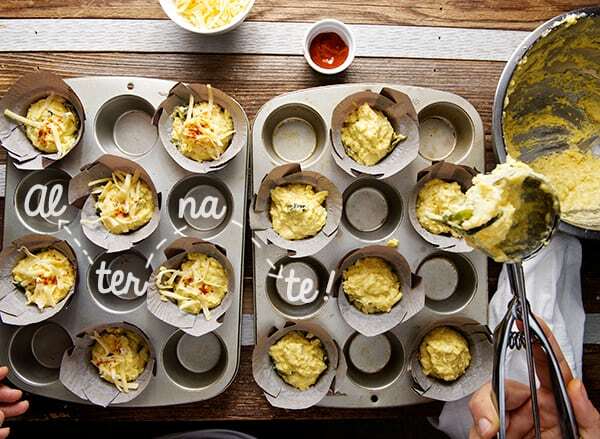 Makes 12 muffins or one 9×13 rectangular baking dish. 1 cup gluten-free all-purpose flour ** Not gluten-free fan? you can use regular all-purpose flour. ¾ cup corn oil. Grape seed oil, sunflower will work too. 2 Poblano peppers roasted, skinned, de seeded and sliced into strips. Remember to save some strips to top the muffins! *If you are in Austin, Boggy Creek Farm has the best one, Lamb’s stone ground meal, or Bob’s Red Mill for a national brand. **The brands I prefer for gluten-free all-purpose flour: Cup4Cup, King Arthur all-purpose gluten-free mix.Not a gluten-free fan, you can use regular unbleached all-purpose flour. *** I always use aluminum free Baking Powder. 1. 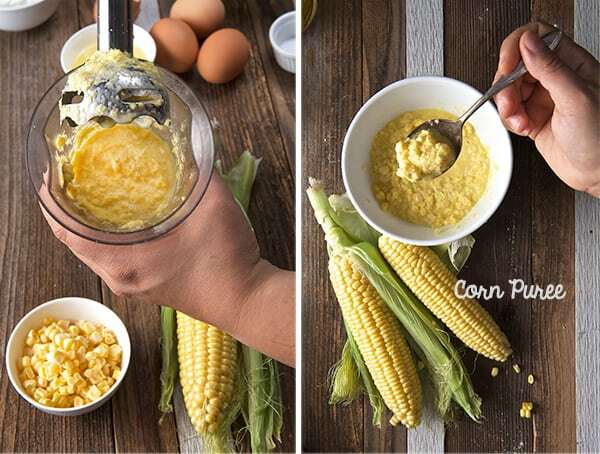 De-kernel 3 ears of corn and blend on the food processor or immersion hand blender, until a coarse purée. De-kernel the 4th ear of corn and add the kernels to the purée. 3. 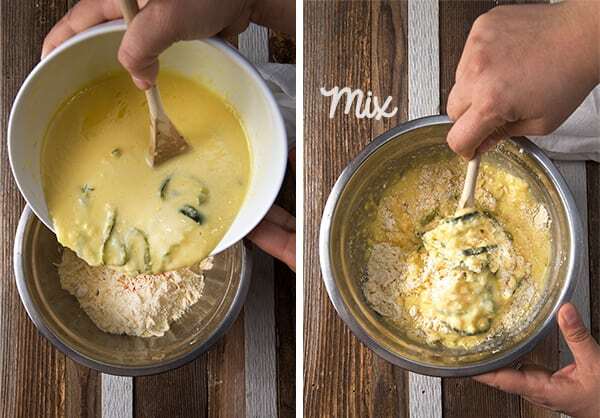 In a medium size bowl mix all DRY ingredients, whisk well to incorporate. Add cheese and toss. 4. 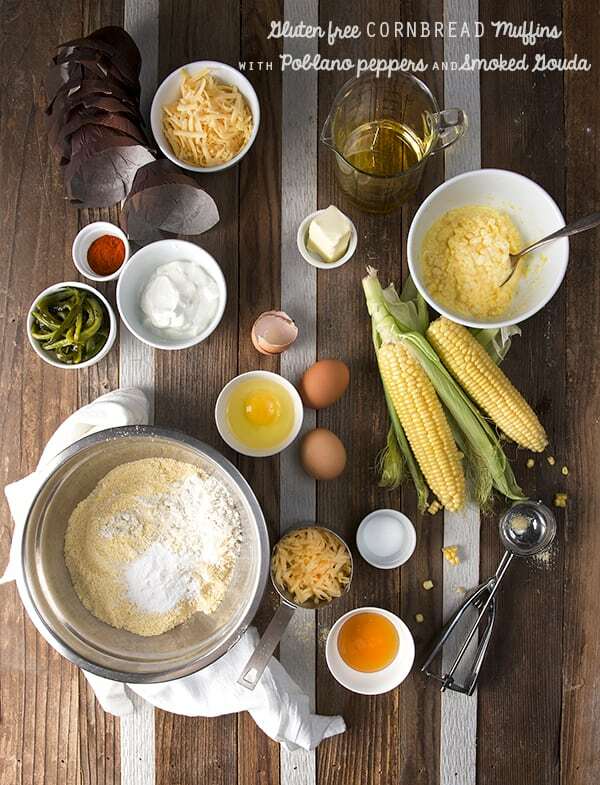 In another medium size bowl, mix all your WET ingredients, including the corn kernel purée and the poblano strips. Remember to save some poblano strips to top the muffins. 5. 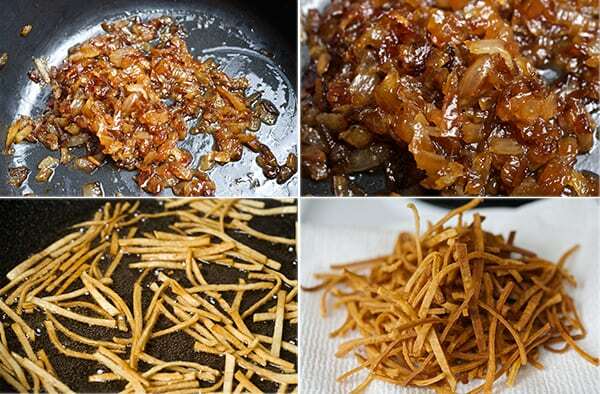 Combine wet ingredients into Dry with a wood spatula, until well incorporated, do not over mix. 6. Apply a little oil to a standard size Ice cream scooper, and fill each cup with a well-rounded heaping scoop of the batter. If you are using smaller cups use a leveled scoop. 7. 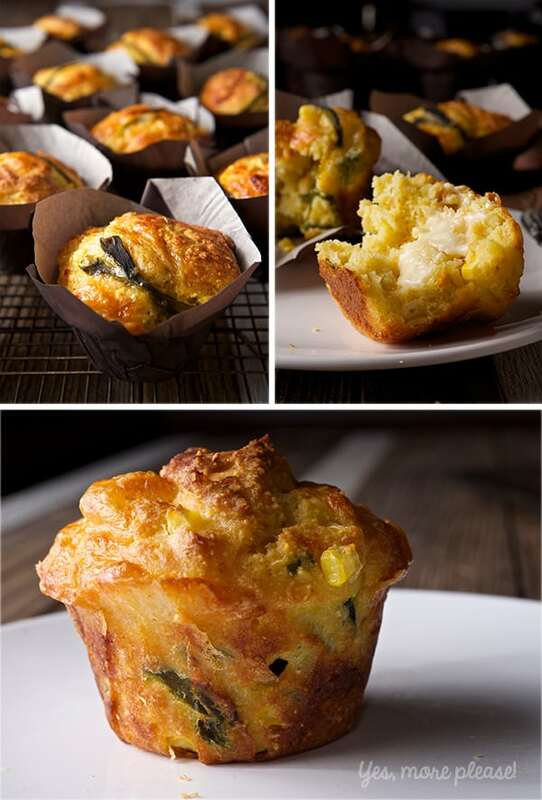 Sprinkle a little cheese, a poblano strip and a dash of paprika on each muffin. 8. Place them into the oven on the lower third rack and LOWER the temperature to 350F. 9. Bake at 350F for 17-20 minutes until golden brown tops and a toothpick comes out almost clean with a few crumbs. Remove from oven and wait for 1-2 minutes, remove from pan into a baking rack or a basket and take them to the table. Enjoy. Baking liners: I used a large paper cups that overlap if you bake them to close. That’s why I alternate them, and I used two trays. I love the medium size muffins and the raised muffin tops. They take about 17-20 minutes to bake. 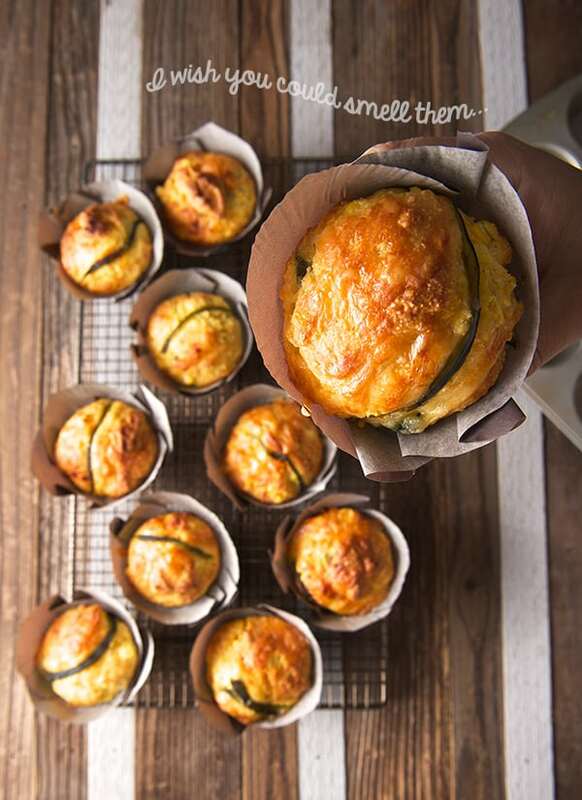 If you are using regular cupcake liners I would say you might have more than a dozen, since they are smaller, and they will bake faster, perhaps 12-15 minutes. So, watch out and keep an eye on them. If you are using dark muffin pans you might have to lower down your oven temperature at 325F since the darker pans retain more heat. This makes for a versatile dish: appetizer, summer dinner, or lunch; place it in any part of a summer’s day. 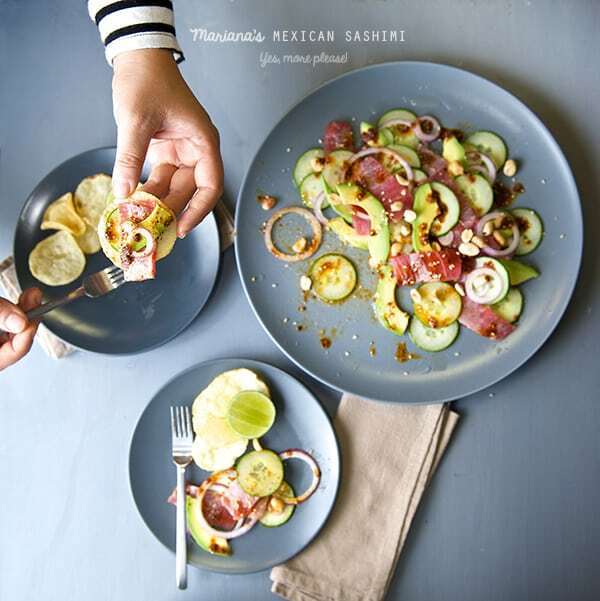 If you just want something lighter, easy, and extremely tasty, with a little Mexican flair, this is your recipe to go!. 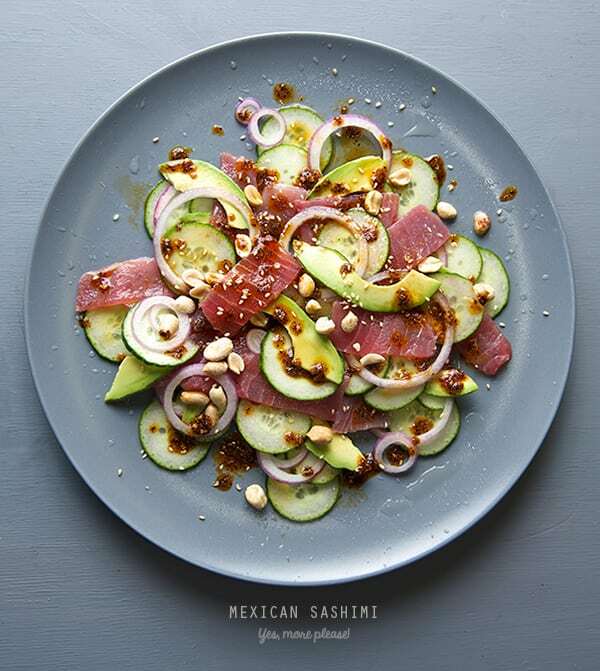 Let me introduce you to my version of Mexican Tuna Sashimi. 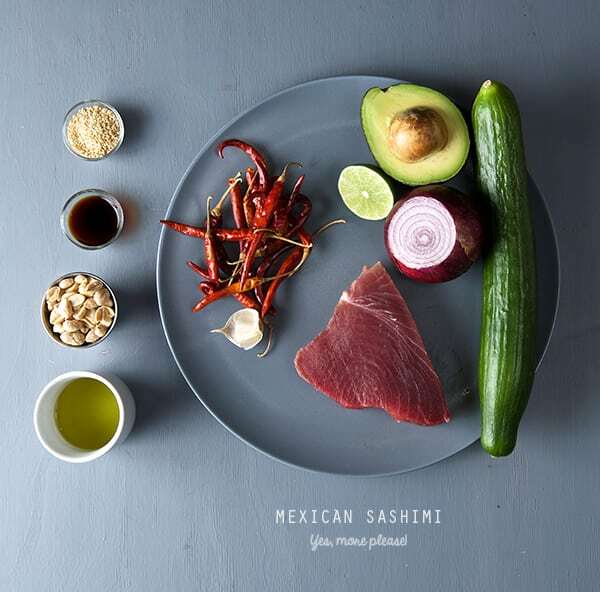 In Mexico there is a kind of sashimi preparation named Agua chile. Agua Chile is a quick appetizer in which shrimp, octopus, are partially cooked in lime juice and a fresh serrano pepper and a couple of dashes of a well known dark sauce seasoning starting with “M” are added. It is ridiculously simple and delicious. I fused a couple of ideas and created this scrumptious appetizer, summer lunch, Desperate Housewives re-runs, or foodie football game night. 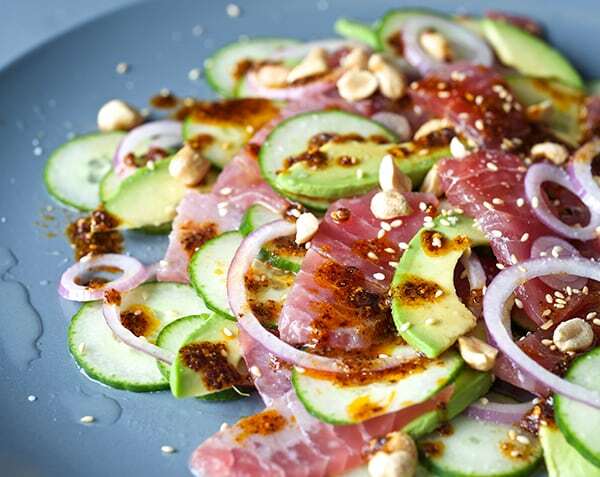 For the recipe sushi grade tuna, a crisp English cucumber, creamy avocado, red onion, lemon juice, soy sauce are plated and combined with my weapon of choice: a red toasted chile de arbol oil sauce. To add some fun and crunch factor, Kettle potato chips or some salty crispy rice chips are delicious on the side to complement the ingredients in this crazy adventure. The result is a cosmic bite that takes you to Japan and back to play at a mariachi band! Please, you must try this. Share and repeat. ½ lb tuna steak, sashimi quality, from sustainable sources, ask your fishmonger for best available. 12 dry Chiles de Arbol remove stems if any. 1 teaspoon toasted sesame seeds. 1. First make the sauce. In a small pot heat up the oil and chiles on medium-low, until the chiles are deep dark red, almost black. Set aside and let it cool. Once its cooled down blend the chiles, the oil, sesame seeds, garlic, and salt until you have thick chili oil. Feel free to add a bit more oil if it is too thick. Set aside. 2. Now, place your tuna steak in the freezer for about 10 minutes before slicing, this way it will slice easily. I usually set up a timer so I don’t forget its there and you end up with a tuna lollipop! 3. 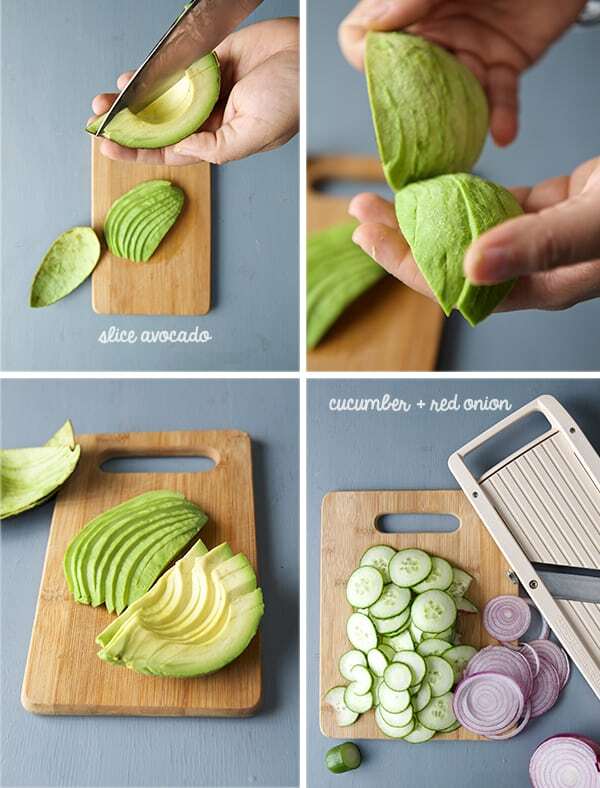 Meantime, with a Mandolin or a sharp knife, thinly slice: cucumber, red onion, avocado. So yes, using my sharp confidence knife I proceed to slice my tuna steak. It is very important you follow the picture below, on how you cut your tuna steak to avoid a tuna massacre. – Cut the tip of the triangle that is separated by a silver tissue. – remove the opposite tip of the triangle, the one that looks darker in color and it almost have no visible grain. This is the most tender and delicious part of the tuna steak, its the little corner that it is closer to the vertebra, therefore its tender. Save it to make two special bites if you want. – Once you remove the two tips, your tuna steak will look more like a rectangular shape. 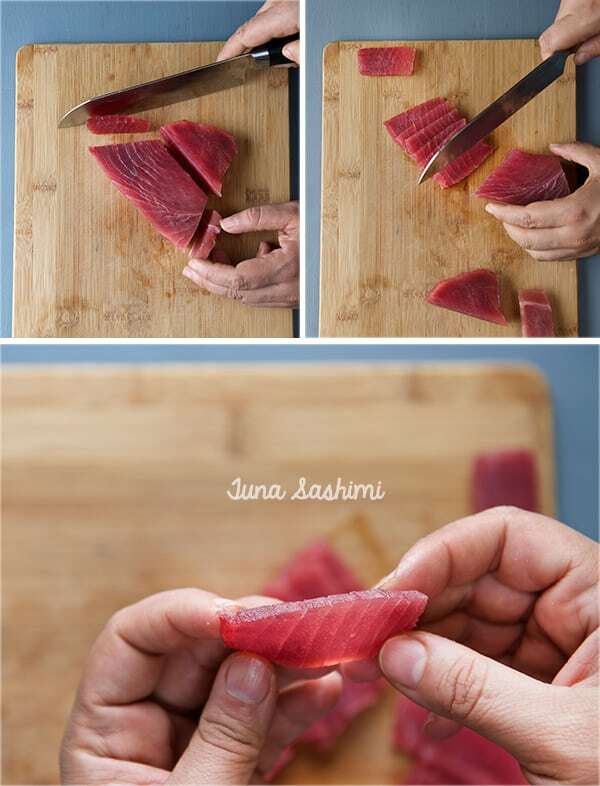 – Start slicing your tuna from the shortest side of the rectangular shape. Making sure you use just one slide motion on your knife like if you are cutting air. Sway the knife to get the cleanest cut possible. 5. Now the fun part begins, layering the flavors. 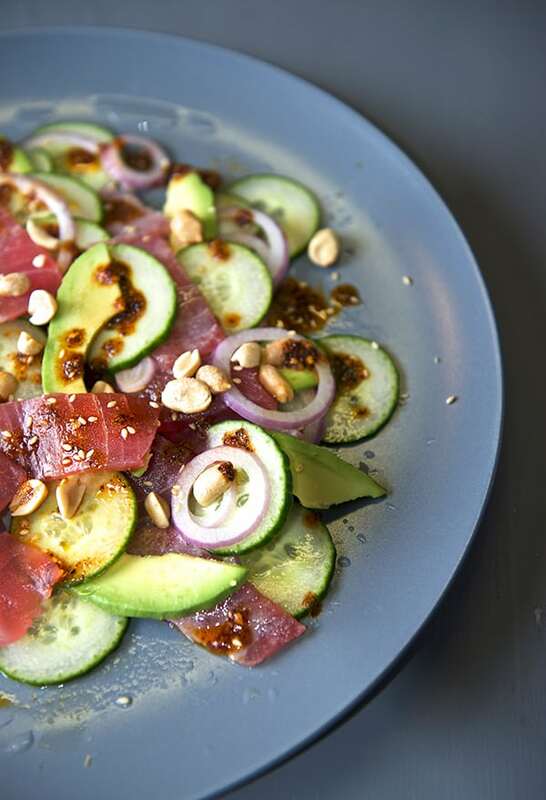 In a large plate or platter, start layering the cucumber slices, onion, avocado and tuna. 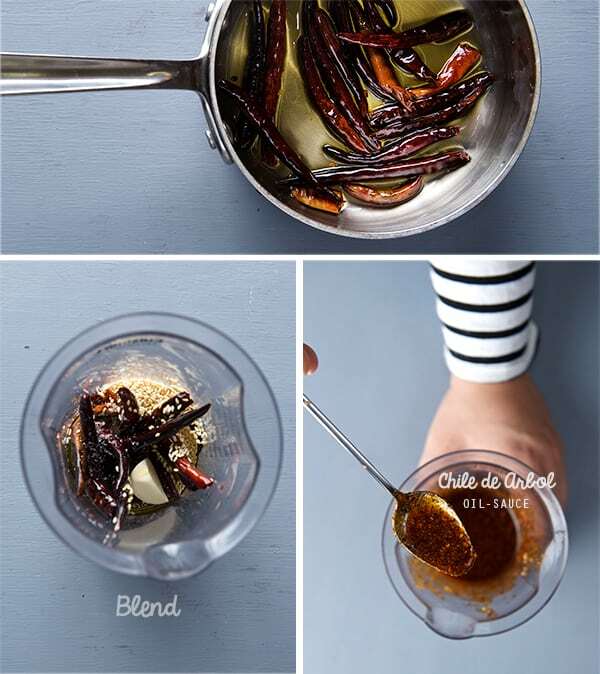 Squeeze some lime juice, soy sauce, mirin, sesame seeds, and little drops of the chili oil. Start another layer, until you finish with your vegetables and tuna. Note: You will have lots of chile de arbol oil left. You can use it on stir fried dishes, shrimp, fish, or save it in a air-tight container in the refrigerator and it will be good for at least 4 weeks. 6. To finish up sprinkle the roughly chopped roasted peanuts on top of the plated items, grab you kettle potato chips, a nice pomegranate margarita, or any drink of your choice, sake, Japanese or Mexican beer will work too! 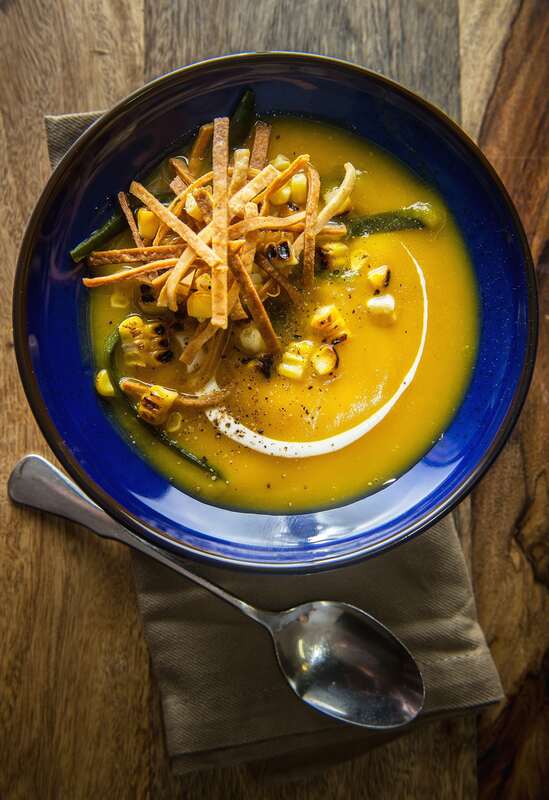 Warm and velvety and with a hint of roasted sweetness….It is inevitable to succumb to the cliche of pumpkin soup. 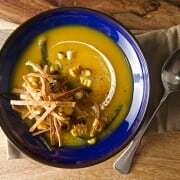 I assure you there are 1,000 recipes out there with all different combinations spices, creamy, vegan, vegetarian…This version is my humble version of the Roasted pumpkin-poblano soup. For the past few years, I’ve been making my vegetable soups under one principle: “do not add chicken stock”. Yes, it is that simple. I don’t want, under any circumstance, my broccoli soup to taste like chicken (or my potatoes, carrots, or any vegetable to taste like the bird). I want to savor the flavor of the vegetable. It is certainly a challenge to follow this principle because our inner chicken stock flavored souls desperately want to add more “depth of flavor”. For me, this is totally wrong. 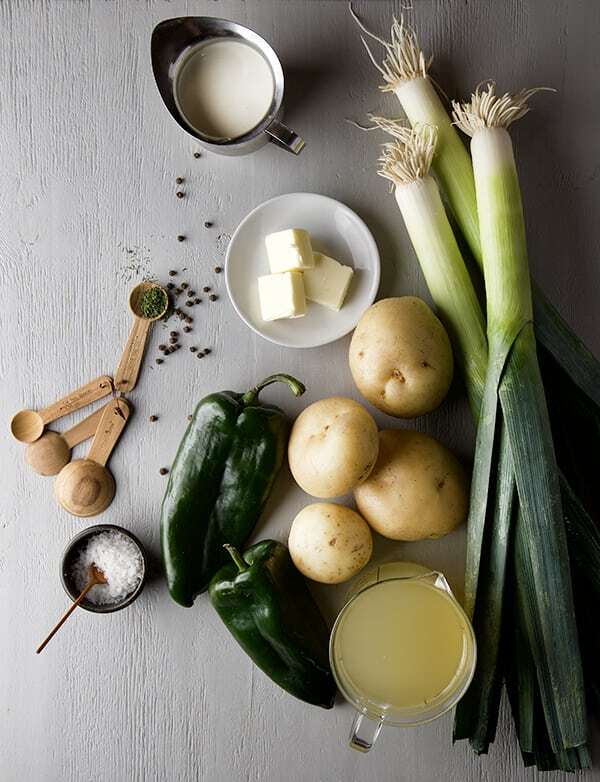 The way I make my vegetable soups are by enhancing the vegetables using different cooking methods like roasting, grilling, braising; all these cooking methods bring out the vegetable qualities, enhance the sweetness and flavor concentration to the soup. And yes, at times just a little help from other vegetable friends can harmonize the flavor. Roasting pumpkin is easy and so rewarding, I love the way the house smells, it’s a welcoming to fall. When getting ready for the pumpkin season, I usually pick 2 small pumpkins the size of a volley-ball or smaller. They are easier to cut in half and they cook faster than the bigger ones. Once I cut them in half, I scrape all the inner seeds, save them for feature roasting if I feel like-, and I place the pumpkin halves flat side down on a full sheet tray covered with foil rubbed with some oil to avoid from sticking. I bake them on the lower rack in the oven at high-temperature 450F for 25-35 minutes or until a paring knife inserts easily through the skin. Remove them from oven and let them cool off. Using a spoon I scrape all the pumpkin ~this is my favorite part so I don’t have to peel the pumpkin, which is hard and lots of work~. 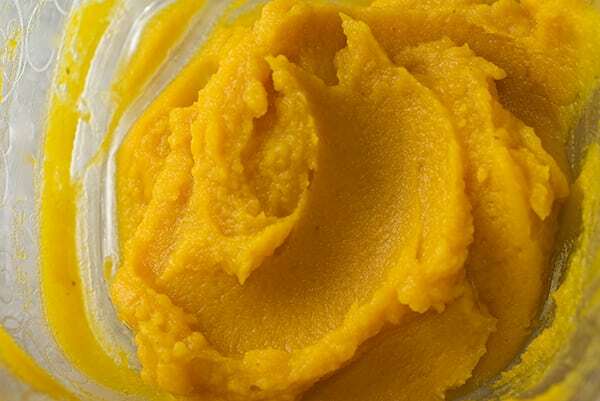 Once I scrape all pumpkin into a bowl, I use my handy-dandy immersion blender to puree the pumpkin. 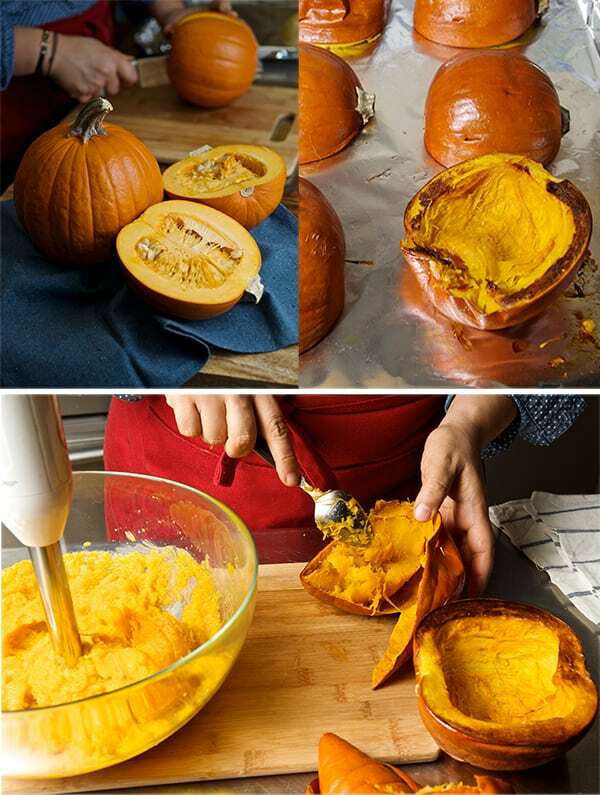 About each pumpkin half yields 1 to 1.5 cups or puree depending on the size of the pumpkin, then I make little reusable bags with 1 or 2 cups of the puree depending on the recipes I want to make, and freeze. 2 pumpkins is usually all the pumpkin I need and I’m ready for the season! Click on this link to check a How to roast a pumpkin tutorial with step by step photos and how to make a delicious pumpkin seed snack! Serves 2 hungry persons as the main dish for dinner or 4 starter soups. ¼ cup of Mexican cream or Greek yogurt, If using Greek yogurt dilute with a bit of water and add a pinch of salt. Over medium-high heat using a heavy bottom soup pot, place the oil the onions and a pinch of salt. Cook until they are soft and translucent. Lower the heat and keep on cooking until deep golden brown and caramelized. Add pumpkin puree, water salt, pepper nutmeg. With the help of an immersion blender blend the soup until smooth.Let it simmer until bubbly hot. Adjust the liquids and salt if needed, for desired consistency and taste. At last, right before serving, add the tablespoon of butter and stir until melted and incorporated. 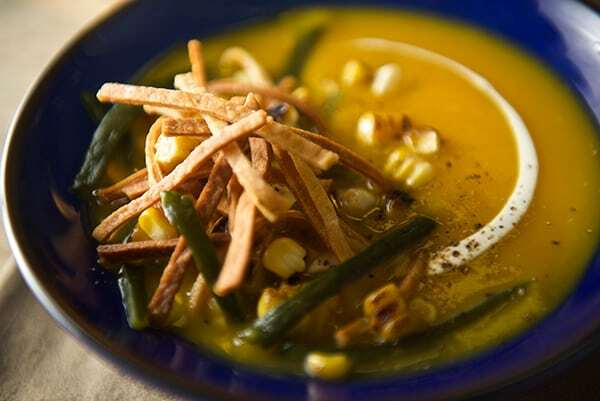 Serve warm in a soup bowl and garnish with the warm poblanos, charred corn, and thinly fried tortilla strips. You can add a dollop of Greek yogurt or a swirl of cream. Use: vegan butter and replace cream swirl with any soy or coconut or almond based cream. 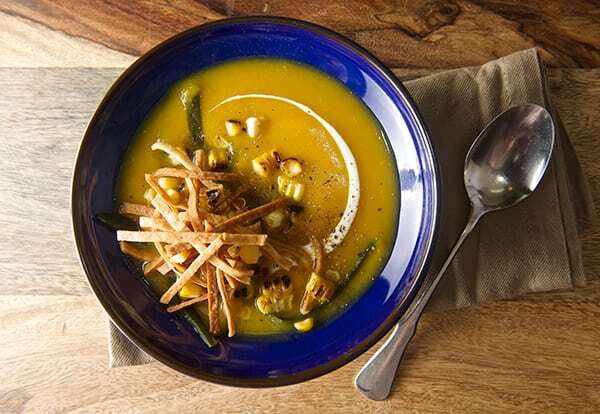 Warm up with this cozy Mexican spin on a fall pumpkin soup! 2 pieces corn tortillas, thinly cut into strips, baked or fried. Over medium-high heat in a soup pot, place the oil the onions and a pinch of salt. Cook until they are soft and translucent. Lower the heat and let them become brown and caramelized. About 7-8 minutes. Add pumpkin puree, water/or/vegetable stock, salt, white pepper, nutmeg. Let it simmer until bubbly hot. Adjust the liquids for desired consistency. At last, add the tablespoon of butter and stir until melted and incorporated. 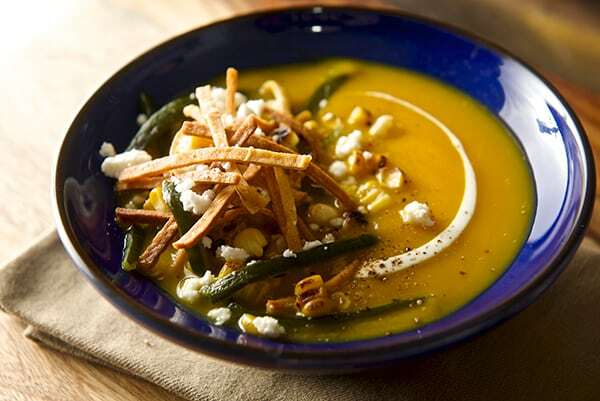 Serve warm in a soup bowl and garnish with the poblanos, charred corn, and thinly fried tortilla strips. You can add a dollop of Greek yogurt or a swirl of Mexican crema. Enjoy! The month of September is the time in Mexico when we celebrate Independence Day, Viva Mexico Goat creatures! That’s the way we shout and celebrate along with lots of tequila and food. There are many traditional dishes that are prepared for this celebration, but the one that represent the season and the first celebration of independence is the Chiles en Nogada. 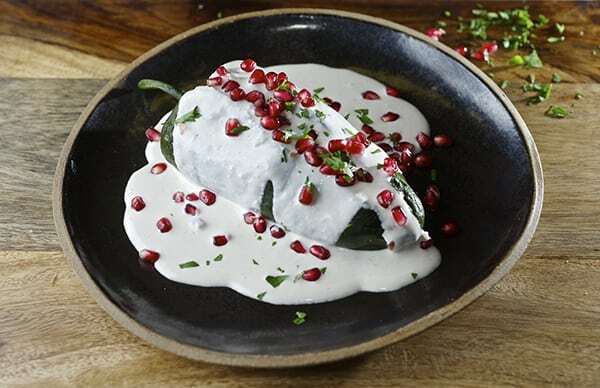 Chiles en Nogada is a regional culinary dish from Puebla. It’s origin dates from 18th century and it is considered a recipe of Baroque style, because of the amount of ingredients and the elaborate and detailed preparation. Many tales and stories argue the origin of this dish. In my curiosity of knowing the most accurate story, I found an article written by Eduardo Merlo Juarez*, from the Investigation Center of INAH-Puebla (INAH-“National Institute of Anthropology and History in Mexico) which I found very credible and congruent. He explains that this dish was made in the Viceroyalty period in Mexican history as a dessert. 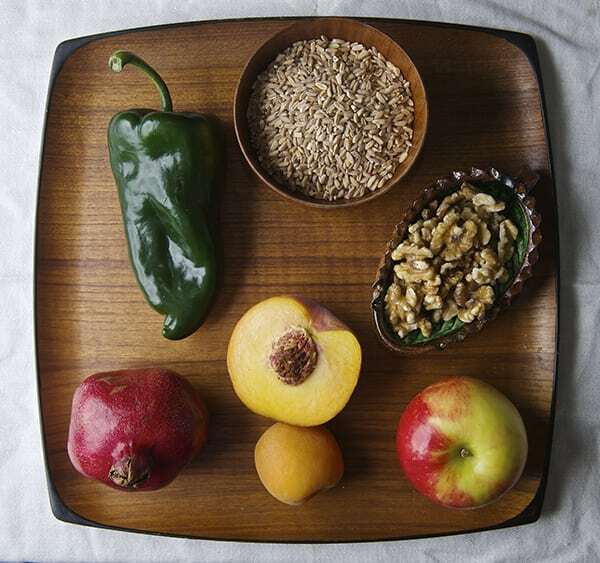 It was created in the month of August with seasonal ingredients from the region; like Poblano peppers, Nueces de Castilla (walnuts), pomegranates, and stone fruits like peaches, apples, pears that the Friars cultivate in the orchards. The nuns, Madres Agustinas Recoletas of the Convent of Santa Monica were the ones who originally prepared this dish for the dinner that was given in honor of the Military Commander Agustin de Iturbide, who entered the city of Puebla in triumph after signing the Treaty of Cordova in Veracruz. This event granted the Mexican Independence from Spain. 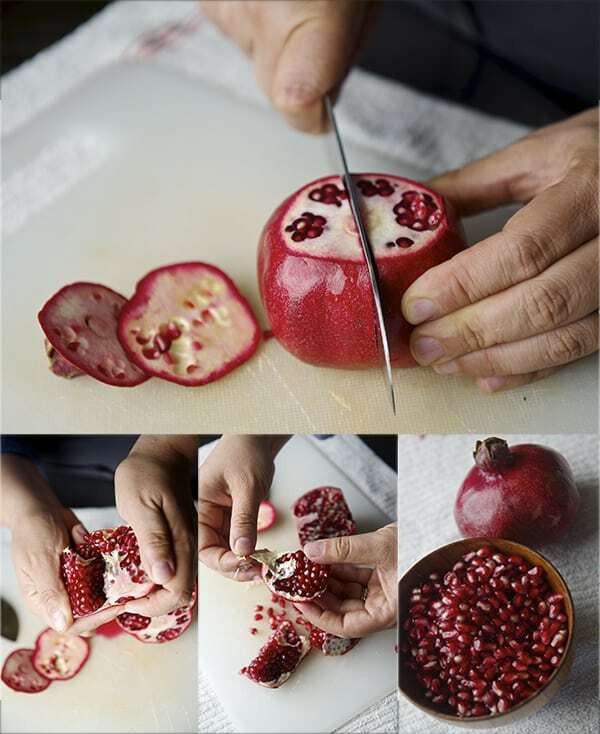 For such an important celebration the nuns used as garnish for the first time, parsley for the green and pomegranate for the red to symbolize the colors of the Mexican Flag. 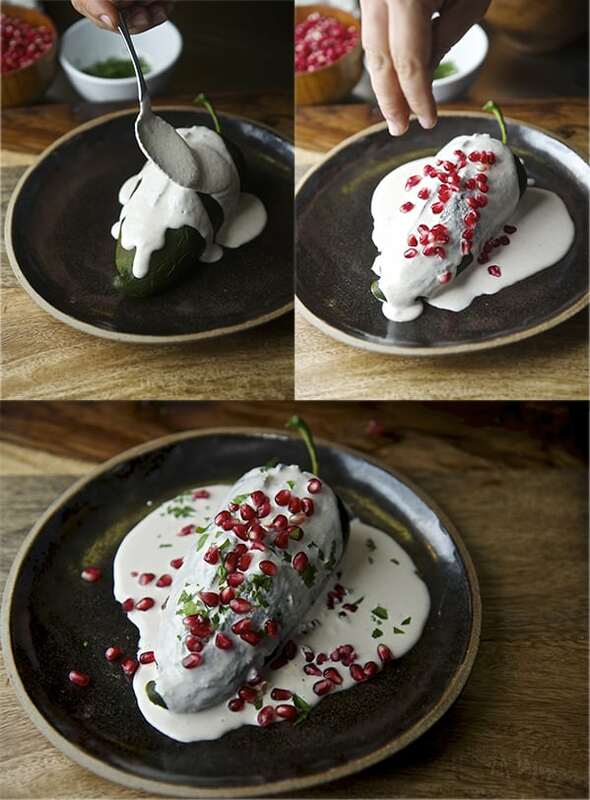 This dish was probably served as dessert, roasted poblano pepper filled with a concoction of delicious stone fruits, that tamed the spiciness of the chile and the creamy sauce to marry the flavors. As in today the chiles are stuffed with a combination of the stone fruits and a 50% ground pork and beef. There has been no way to track who added the ground pork and beef to make the sweet picadillo which is now traditionally used as filling. 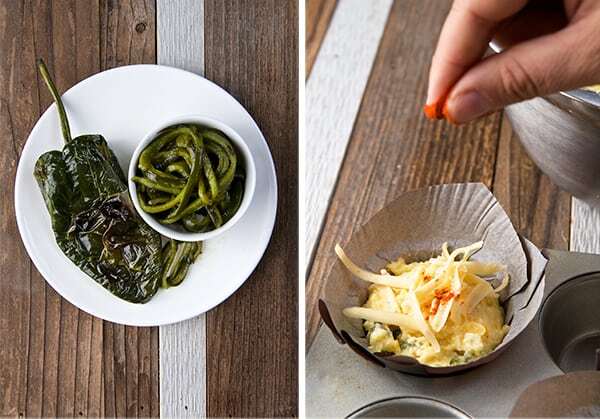 Many arguments have been raised about whether they should or should not be covered in the egg batter as in Chile Relleno style; the truth is you can find them both ways based upon preference. 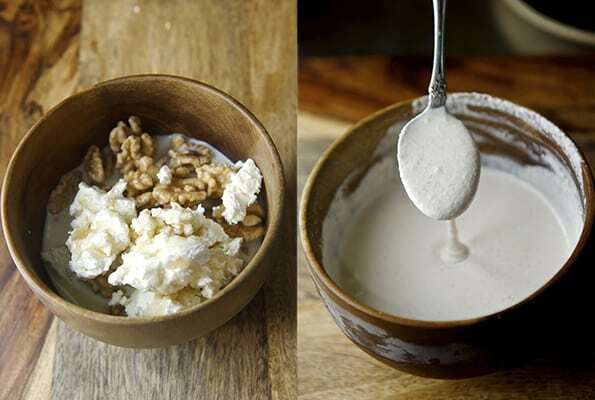 The original sauce was made with walnuts, Goat cheese, a little bit of milk, and a dash of sherry vinegar. It is preferable to serve them at room temperature and the sauce is always best served cold. In this recipe I wanted to keep the essence of the dish and simplify the preparation time without compromising the flavors, I prepared the filling using Farro to make it lighter (and because it has a meaty texture that resembles to ground pork). I maintain the use of stone fruits and spices. And versus the original long cooking method, I added the fruits later on in the cooking process to have contrast in textures. I believe that this recipe is simple enough to make and results in a light entrée for you to serve, rich in flavors, culture and tradition. In a baking sheet pan lined with aluminum foil place the poblano peppers and rub them with a little canola oil and sprinkle some sea salt. Roast them for about 3-4 minutes per side at a 450 F pre-heated oven. It is best to char them on the stove over direct flame because it gives them more flavor. In this case I do not own a gas stove or a torch (sad, sad…but the oven method works great to easily remove the skins) I did not grill them. I think the flavor of the smoke charcoal would be too overwhelming for the filling. 1 teaspoon of sherry vinegar. a pinch of ground clove. A pinch of white pepper. 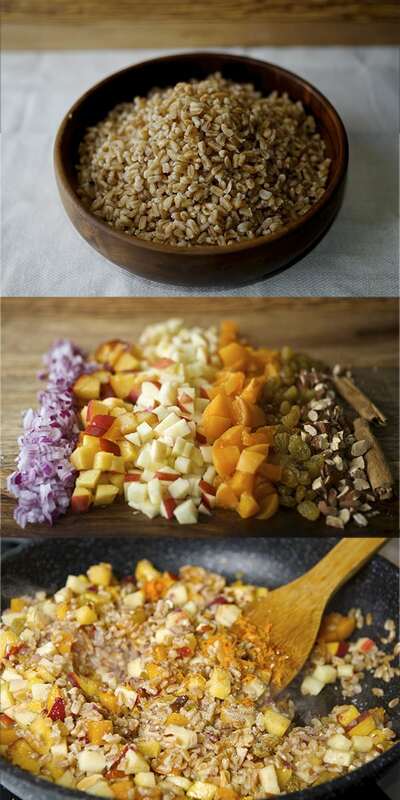 Start by adding your Farro to a small sauce pan with a little canola oil and sauté it until slightly golden brown. Add 2 cups of water and let it come to a boil, then reduce the heat, cover and let it simmer. Add a pinch of salt. Keep an eye on it since you want to leave it a little under done for the best texture and flavor. Once it is cooked, spread the Farro on a platter to stop the cooking process and to release some of the moisture. Let it cool for about 10-15 minutes. Meantime, chop the rest of the ingredients. Now that you have everything ready, heat a sauté pan with about 2 tablespoons of canola oil, sauté onions and garlic and cook for about 2 minutes. Next, add apples, pears, almonds, raisins, sherry and spices cook for 2 minutes. Add the Farro and sauté for another 2 minutes. Then add the peaches and apricots. Adjust salt and pepper. 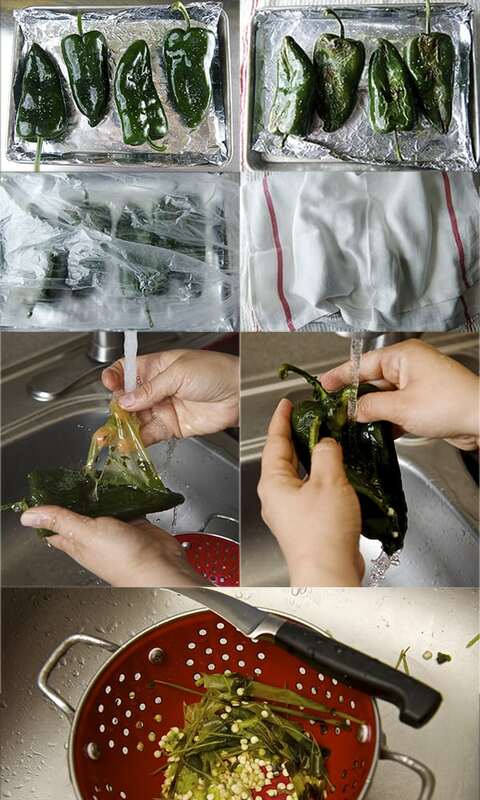 Remove from stove and let it cool to room temperature before stuffing the roasted poblano pepper. 1 ½ cup of Walnut halves soaked and twice rinsed. Start by stuffing the poblanos, arrange them on a platter or in individual plates, cover them with the walnut sauce, garnish with pomegranate kernels and finely chopped parsley. Traditionally they are serve in Talavera plates from the state of Puebla. I chose this beautiful stoneware plate with an iridescent brown-black glaze made by a Local Artist her name is Barbara Breyfogle she has her own studio and makes one of a kind handmade stoneware pottery. She has been making pottery since 1974. In some of her pieces she uses lace and nature to stamp some designs on her plates and serving platers.You can find her and her beautiful creations at Boggy Creek Farms on Saturdays from 8-1 pm. Or send her an e-mail: [email protected]……Thank you Barbara! !